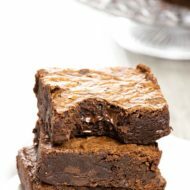 This recipe makes chocolatey cookies that are amazing warm from the oven for the ultimate indulgence. 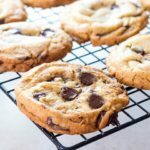 This easy recipe for The Best Homemade Chocolate Chip Cookies makes perfect cookies that are crispy on the outside with a soft & chewy center. 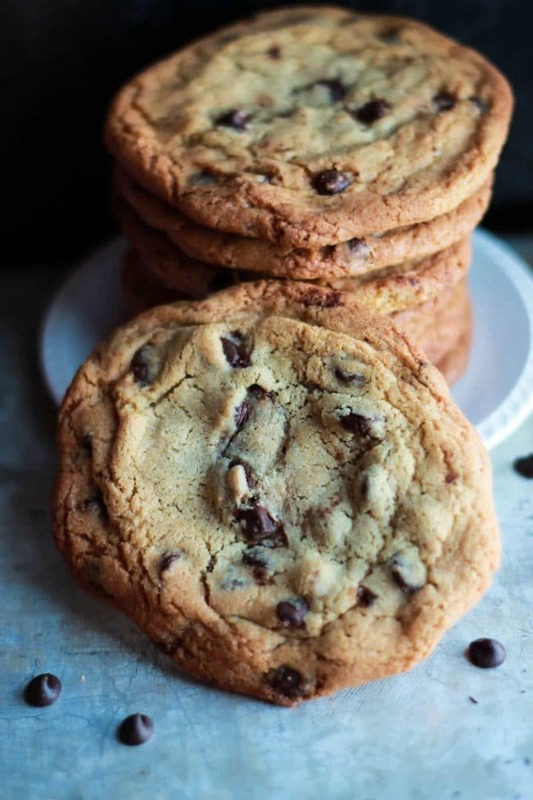 Chocolate Chip cookies are one of the best things on earth and this recipe is no exception! 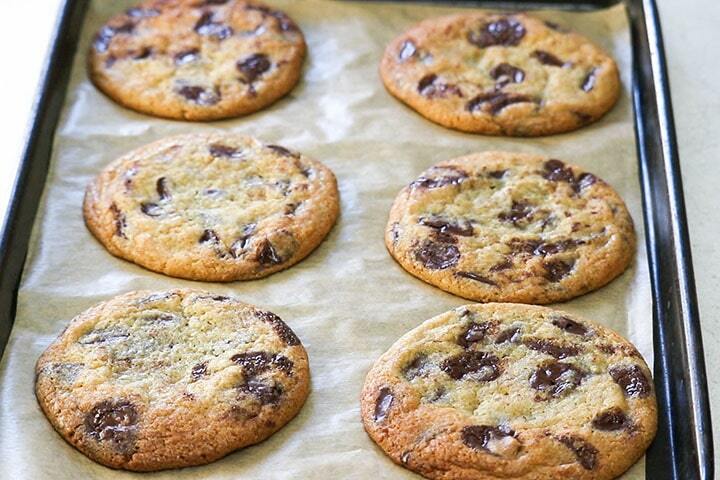 There’s something so special about chocolate chip cookies. The smell alone just makes you happy and feels like home and childhood memories rolled into one. And the first bite is always pure bliss – especially when they are fresh from the oven. 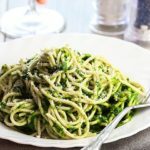 This is one of the recipes I am most proud of. Anyone who has ever had them just raves about them and I make these more than any other recipe I have ever created. When I first posted this recipe in 2014, it was made using all-purpose flour, but many people had problems with the cookies turning out too flat. I tested many different ways to fix that and after months of testing, I finally found perfection by taking out a half cup of all-purpose flour and replacing it with white bread flour. This kept the cookies thicker without affecting the great taste of the original recipe! 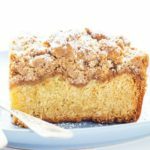 Using mainly brown sugar instead of white sugar adds flavor and cuts the sweetness. The addition of bread flour keeps the cookies from flattening & creates a chewier bite at the center of the cookie. Using all butter in place of shortening gives these cookies a buttery richness that’s hard to beat. 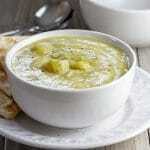 Use ingredients that are room temperature. 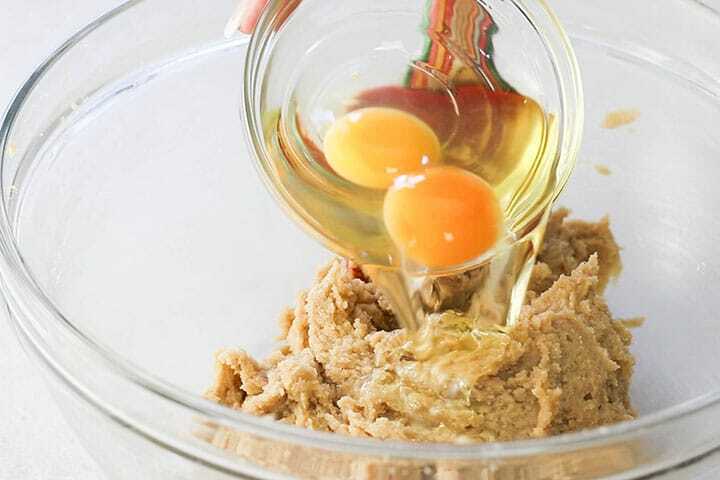 Room temperature eggs and butter combine easier with dry ingredients that are already at room temperature. The result will be a well-combined dough. Use an electric mixer for creaming butter. An electric mixer forces air into the butter in a way that’s almost impossible to do by hand. This will make the cookies lighter. Stir in the dry ingredients by hand. 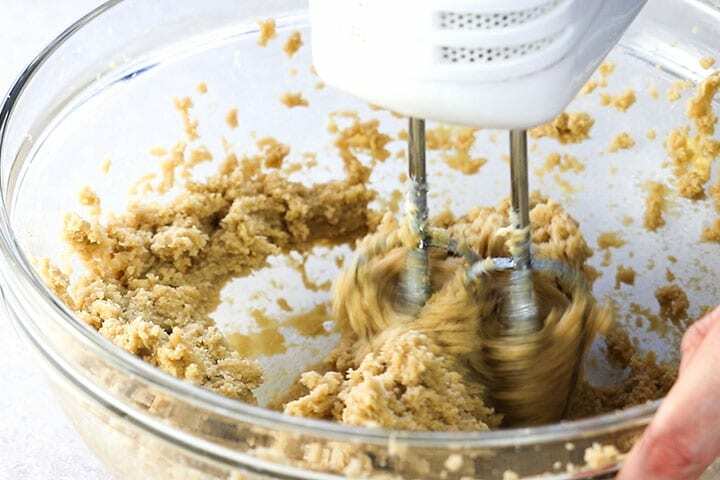 Over mixing will make cookies tough and it’s easily done with electric mixers. Space out the cookies on the pan. 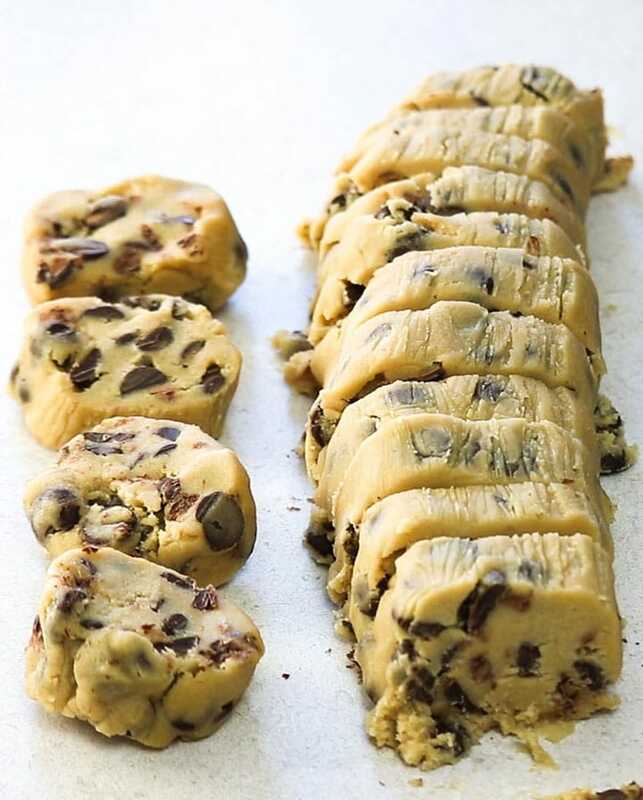 Place the cookie dough about 2 inches apart to prevent cookies from spreading into each other when baking. 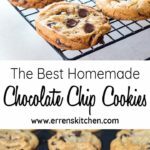 You can use whichever chocolate chips you like best! Just keep in mind that milk chocolate and white chocolate chips are much sweeter than dark chocolate, semi-sweet and bitter-sweet so you may want to adjust the levels of sugar. 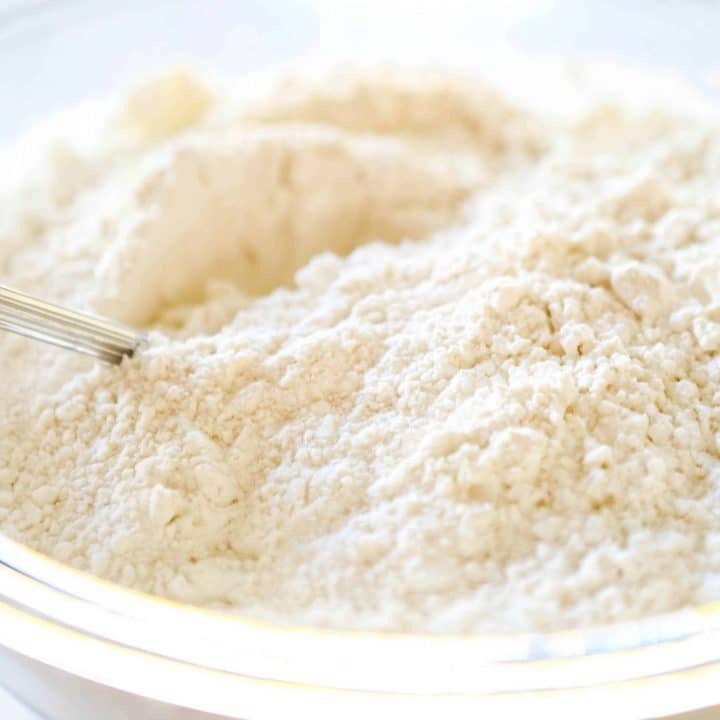 To make them, start with sifting the flour, salt, baking soda, and baking powder together. Add the butter sugar and brown sugar to another bowl. Cream the butter and sugar together until light and fluffy. Add the flour mixture and mix until combined. Stir in the chocolate chips by hand. Shape into a log in plastic wrap and chill until firm 30 minutes – overnight. Cut into 1 inch thick slices. Line six disks onto a cookie sheet 2 inches apart. and transfer to a cooling rack – try not to eat the whole batch right out of the oven! 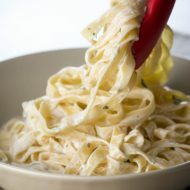 Use softened butter: Soften your butter to room temperature. You’ll know when it’s soft enough when you can make a dent in the butter when pressed. 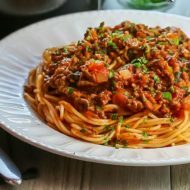 Don’t Over Mix: Once you add the dry ingredients, mix gently. 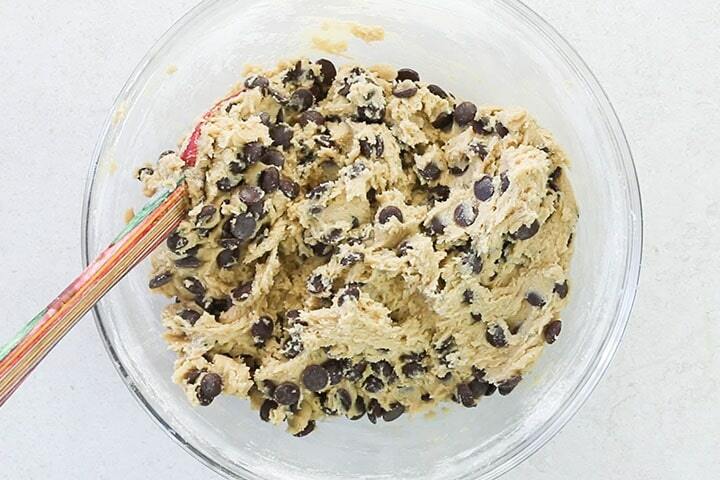 Over mixing the dough will give you a tough cookie. When in doubt – finish the job by hand. Mix until the flour is just incorporated. Don’t over bake your cookies. When chocolate chip cookies come out of the oven, they should be slightly underdone in the middle. 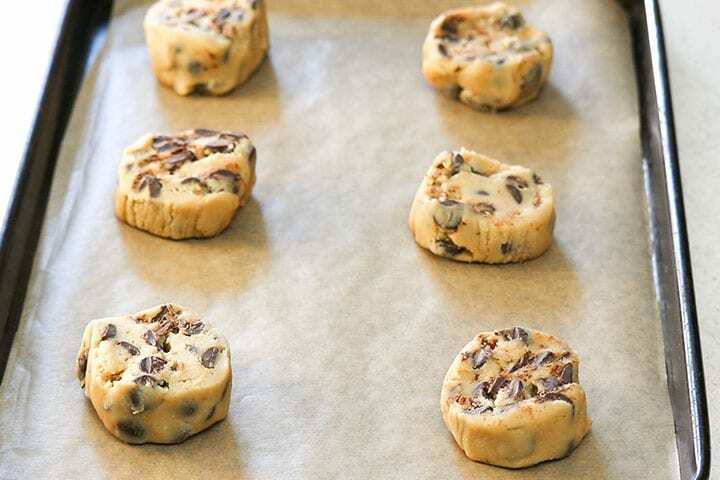 Leave them to set on the hot cookie sheet for a few minutes before transferring them to a cooling rack. Like a thicker, softer cookie? Add an extra half cup of flour to the recipe. It creates a soft cookie that only gets softer as they cool. 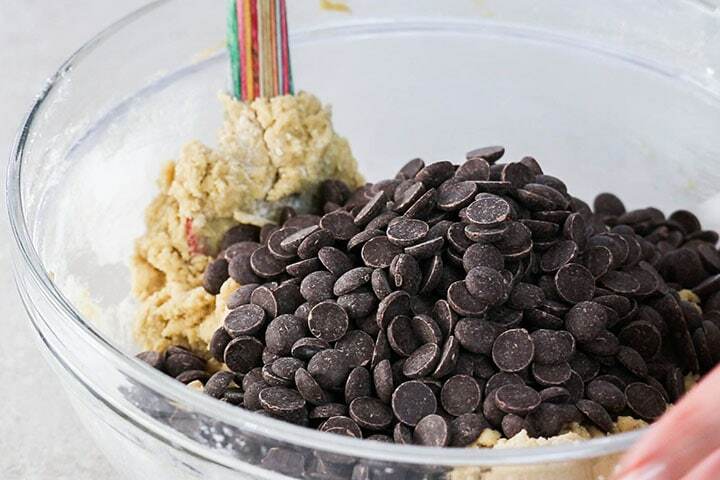 Do You Have to Chill Chocolate Chip Dough Before Baking? Yes, chilling the dough is an important step in this recipe. 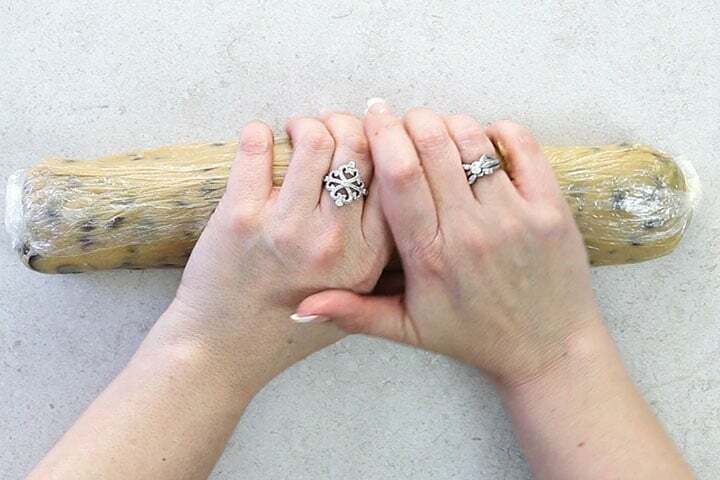 It allows the butter to solidify after mixing and stops your cookies from becoming too thin. Chilling also allows the flavors in the dough to develop and it helps create that crisp outside and chewier middle. Can Chocolate Chip Cookie dough be frozen? Chocolate Chip Cookie dough really freezes well. 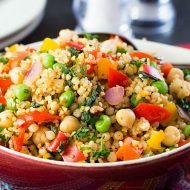 Freeze the prepared dough for up to three months. Just thaw in the fridge, slice the chilled dough and bake. How do you store Chocolate Chip Cookies cookies? 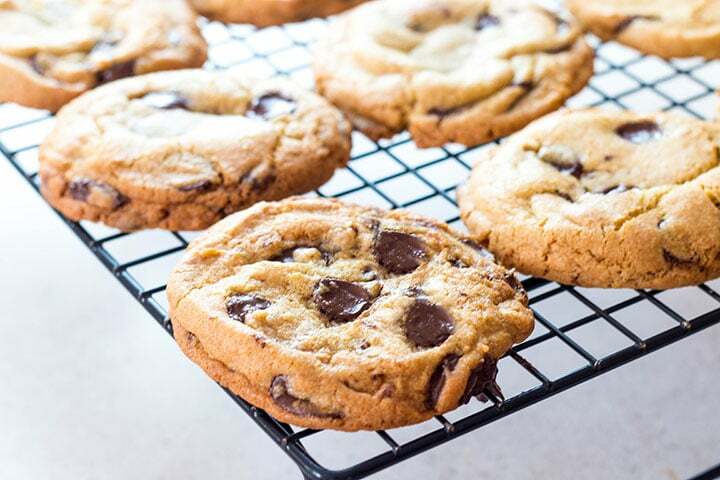 To store Chocolate Chip Cookies, cool until they’re room temperature, then store in an airtight bag or container for up to 3 days. 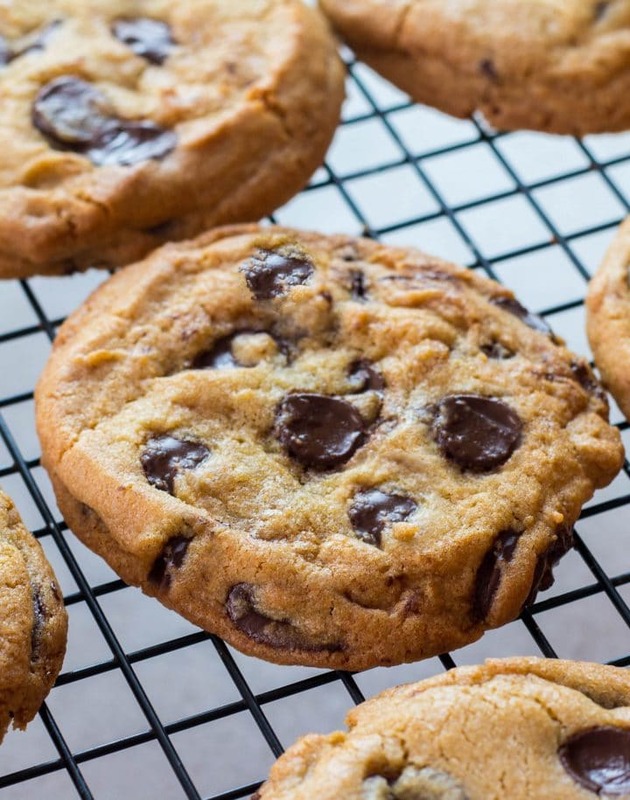 Storing Chocolate Chip Cookies when they’re still warm creates steam, which will make them soft and crumbly. 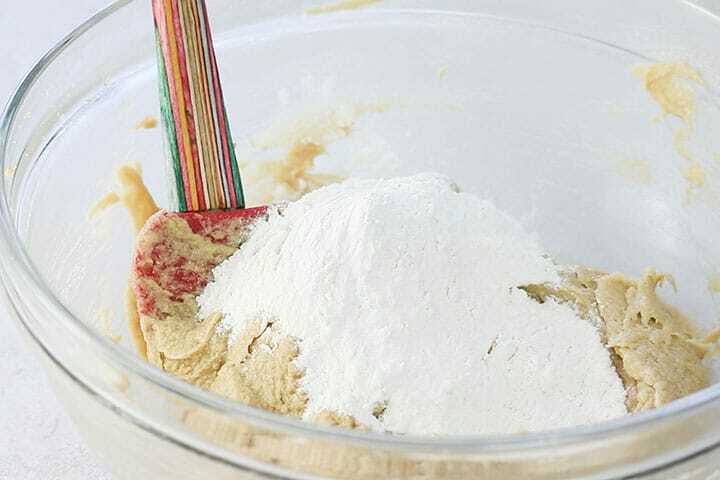 Sift the flour, bread flour, salt, baking soda, and baking powder together into a large mixing bowl. In a large mixing bowl. beat the butter, brown sugar and granulated sugar in until fluffy. Mix in the flour mixture and mix until combined. Stir in the chocolate chips by hand. Shape into a log in plastic wrap and chill until firm 30 minutes – overnight. Preheat the oven to 375 degrees F/190C. Bake until the cookies are golden brown around the edges but soft in the middle, about 10 - 12 minutes. The original recipe did not include bread flour. This was added to keep the cookies from flattening too much. 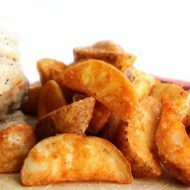 If you were a fan of the original recipe, just omit the bread flour and add a half cup more of all-purpose flour. 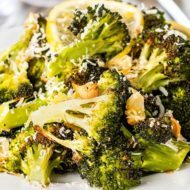 Update Notes: This post was originally published on Jan 15, 2014, but was republished with a slight change in recipe, step by step instruction photos, and a video, and tips in February of 2019. These cookies look perfect! So soft and chewy! Oh my goodness! These cookies are so inviting! I need to put them on my weekend baking list! I’m glad you like them, Catalina! 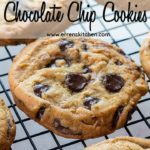 My husband said “ Chocolate chip cookies sound good.” So I decided to be a sweet wife & make some for him.Absolutely Fabulous Recipe! I appreciated your helpful tips. My husband & son really enjoyed the cookies. 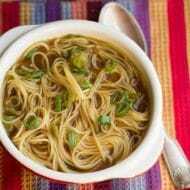 Thank you for sharing the recipe & great helpful hints! That is so awesome to her Chrissie, Thank you for your lovely feedback! Yes! Chilling the dough is so important. These came out beautifully, thanks. I’m glad you enjoyed Sabrina! I’ve never met a chocolate chip cookie I didn’t like! 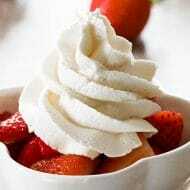 The perfect treat. They are so good, aren’t they! Hi Kelsey, I use salted, but it’s a personal preference. I’m so glad you all enjoyed them so much, Gina! They’re a favorite in thus house too! Hi Erren, how many cookies is 1 serving? Is 1 cookie = 388 calories? Hi Dee, I ran the software again to make sure. It’s approximately 292 calories per cookie. The recipe makes 18 -24 cookies so an exact number is difficult to pinpoint. Hope this helps. 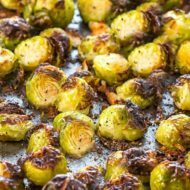 Two ideas for you: try using Domino maple brown sugar instead of plain brown sugar and dark chocolate chips and I also add 1 cup coarsely broken toasted pecans. Takes chocolate chip cookies to a new level. NOte The domino maple brown sugar is lighter in weight than regular brown sugar so you may need 1/4 c. more. I weigh my ingredients. Hi Alyson, Sounds delicious I’ll keep it in mind, Thank you for your feedback!